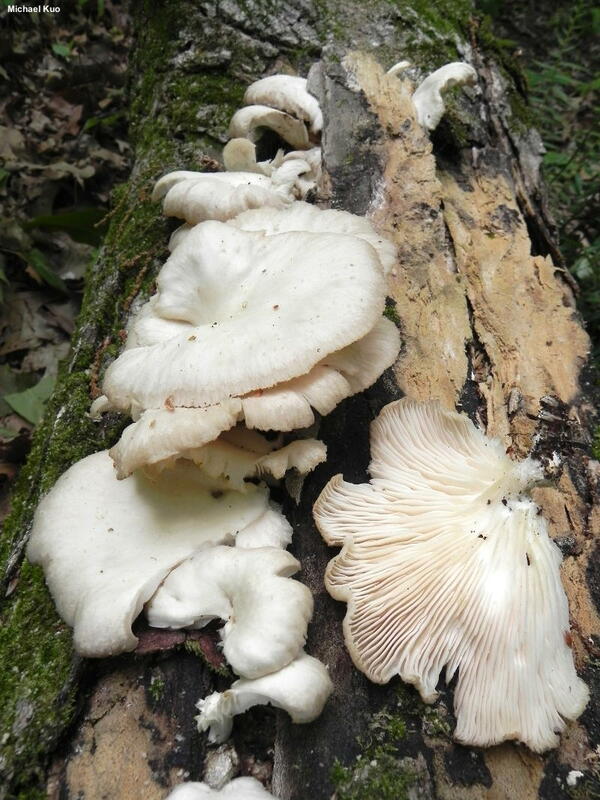 The separation of Pleurotus pulmonarius from the better-known, "true" oyster mushroom, Pleurotus ostreatus, is based on very good evidence that covers the three "species concepts" most commonly applied to fungi. In the laboratory, Pleurotus pulmonarius cannot "mate" with the other species in the oyster complex, so it is a good biological species. It also represents a fairly distinct morphological species, since it is paler (and frequently smaller) than the brownish Pleurotus ostreatus and appears to develop more of a stem, more of the time. DNA evidence supports Pleurotus pulmonarius as a phylogenetic species and, to top it all off, there is an ecological difference: it appears in warmer weather, appearing from late April through September, while Pleurotus ostreatus favors cold-weather conditions and appears from October through early April. Pleurotus populinus is also virtually identical, but it grows only on the wood of Populus species (aspens and cottonwoods). 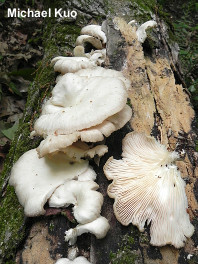 Pleurotus pulmonarius will grow on the wood of virtually any hardwood, including aspens and cottonwoods--in which case the larger spores of Pleurotus populinus will help separate the species. 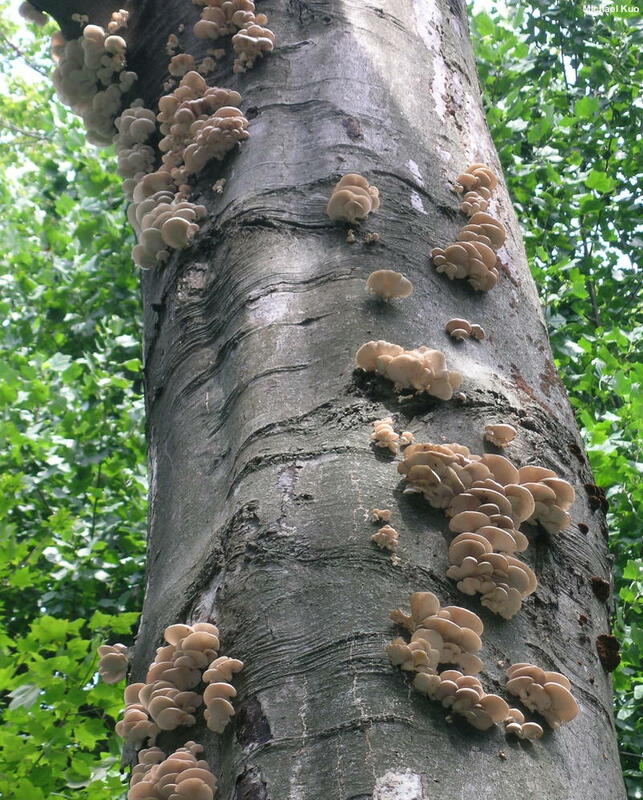 Ecology: Saprobic; growing in shelf-like clusters on dead and living wood of hardwoods; causing a white rot; late spring through September; apparently widely distributed in North America. The illustrated and described collections are from Illinois, Missouri, and Kentucky. 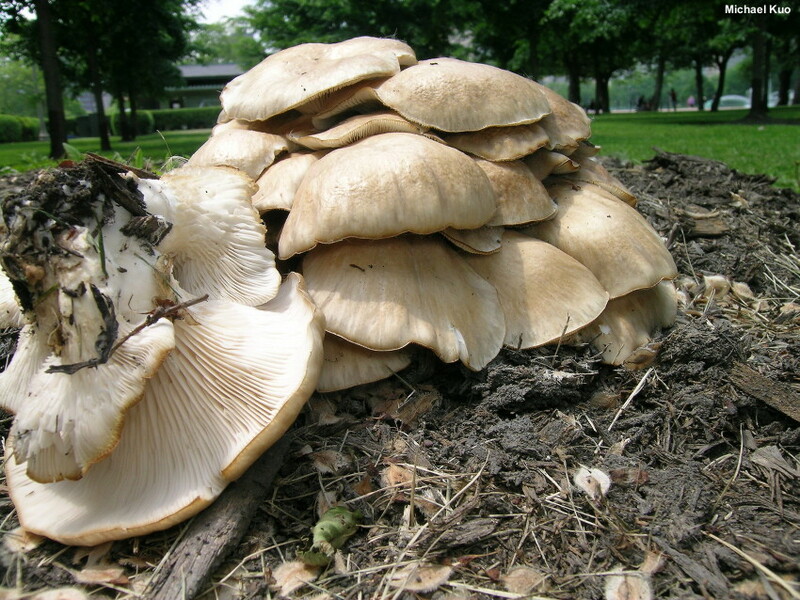 Cap: 3–10 cm across; convex, becoming flat or somewhat depressed; lung-shaped (hence its Latin name) to fan-shaped or semicircular in outline—or nearly circular if growing on the tops of logs; somewhat greasy when young and fresh; fairly bald; whitish to beige or pale tan, usually without dark brown colorations; fading as it dries out, often resulting in a two-toned appearance; the margin inrolled when young, later wavy and sometimes very finely lined. Gills: Running down the stem; close or nearly distant; short-gills frequent; whitish; sometimes discoloring yellowish with age. 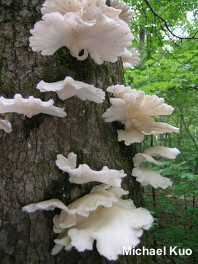 Stem: Sometimes absent or rudimentary, but often present; 1–4 cm long and 0.5–1 cm thick; eccentric or lateral—or central; whitish; bald; basal mycelium white. Odor and Taste: Odor distinctive but hard to describe ("like oyster mushrooms" works well, but makes for a circular description); taste mild. Chemical Reactions: KOH on cap surface orangish. 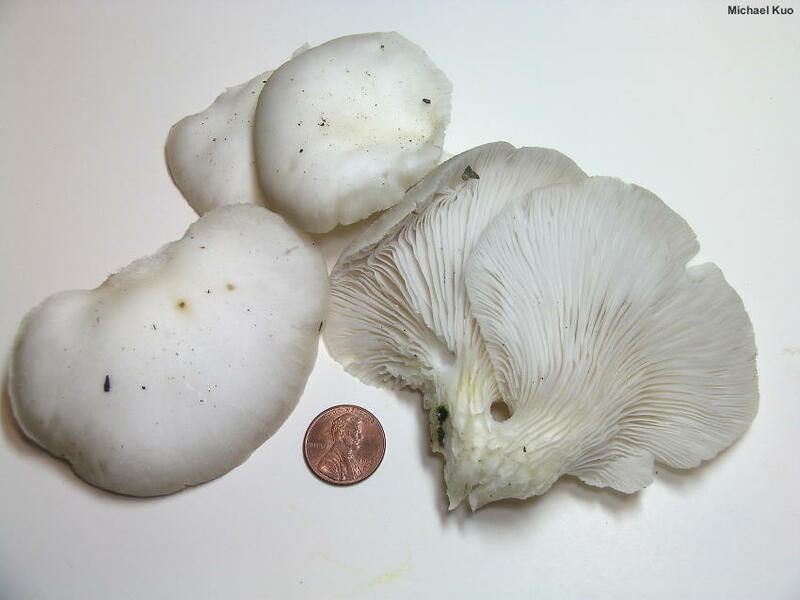 Spore Print: Whitish, grayish, or lilac. Microscopic Features: Spores 7–11 x 2–3 µm; cylindric-ellipsoid; smooth; hyaline in KOH; inamyloid. Hymenial cystidia not found. 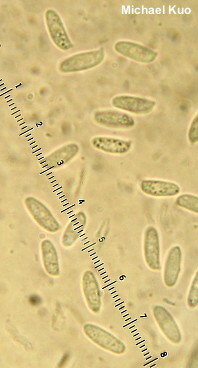 Pileipellis a cutis; elements 5–10 µm wide, smooth, hyaline in KOH. REFERENCES: (Fries, 1821) Quélet, 1872. (Guzman et al., 1994; Vilgalys & Sun, 1994; Vilgalys et al., 1996; Zervakis & Balis, 1996; Trudell & Ammirati, 2009; Kuo & Methven, 2014; Evenson, 2015; Cripps, Evenson & Kuo, 2016; Petersen et al., no date.) Herb. Kuo 07010304, 06020801. Herb. EIU 008.